In researching Samuel Newport, my wife's great great grandfather, and other family members, I discovered transcripts of letters written by Samuel in November 1842. One letter was to G.H. Dashwood Esq. of West Wycombe Park asking that it be shown to the neighbours. It required little research to discover who Dashwood was: Sir George Dashwood, the 5th Baronet. He was a Liberal Whig representing Buckinghamshire and later Wycombe as a Member of Parliament in England. A friend mentioned the Dashwood Pass on State Highway 1 south of Blenheim so more research. On the passenger list of the "Mary", which arrived in Nelson 24th February 1849, I discovered one Edwin Dashwood, 19, an agricultural labourer. Edwin Hare Dashwood was much more than an agricultural labourer. He was born in West Wycombe 7th Sept. 1825, son of Capt. Edwin Sandys Dashwood and Emily Hare. He was educated at a military school in Germany, obtained an ensigncy in the 10th Regiment of Foot (North Lincolnshire) and served in India before resigning and coming to Nelson. He purchased a farm in Motueka and a sheep run in the Awatere, Blenheim. In 1852 he returned to England. He married Roberta Henrietta Abercromby at Forglen House, Forglen Banffshire Scotland on the 25th October 1853. The couple returned to Nelson bringing with them the cutter "Sprite" that had been built at Cowes for his uncle George Henry Dashwood. The young Dashwood started ferrying passengers between Nelson, Motueka and Collingwood. Dashwood's other activities were many and varied. He raced the cutter in Yacht Club events, was active in looking after the affairs of other ex officers of the Army & Navy, was a Stock agent, land agent, and landlord and served on Grand Juries. His circle appears to have included the notables of Nelson. The name Dashwood appears over 400 times in the Nelson Examiner of the day. In 1859 Dashwood, now the father of three Nelson born sons. sold off his interests in New Zealand and returned to England, due to the illness of his uncle, Sir George Dashwood. Sir George died on 4th March 1862 and was succeeded by his brother John. In 1863 Edwin Hare Dashwood, the agricultural labourer who had arrived in Nelson in 1849, succeeded his uncle John, who died unmarried, as 7th Baronet. He also inherited West Wycombe Park. Sir Edwin Hare Dashwood died in 1882. The New Zealand connection continued. Edwin was succeeded by his oldest son Edwin Abercromby Dashwood, who had returned to New Zealand in approx. 1874 as a Kauri gum digger. He married Florence Norton in Auckland on the 24th August 1889, returning to England that year to take up his inheritance and become the 8th Baronet.2 He died suddenly on 7th April 1893 at West Wycombe and was succeeded by his brother Robert. Robert John Dashwood, the 9th Baronet had returned to England with his parents. He married Clara Adelaide Ida Conyers Lindsay at St. Saviors Paddington 25th July 1893. He died 9th July 1908 and was succeeded by his son, John Lindsay Dashwood (1896-1966) as the 10th Baronet. Ownership of West Wycombe Park has now passed to the National Trust, although the Dashwood family still reside in the Manor. For more information about the Dashwood family, click here. Want to find out more about the Edwin Hare Dashwood (1825-1882) ? View Further Sources here. The link below may be of interest, as it covers the roles of Henry Young and Theo Mannering in establishing the "Culverden" sheep station, based on Mannering's memoirs. Henry Young was an absentee landowner who never lived there. "Culverden" was an unlucky run - no one who owned it did well with it. it was eventually subdivided into smaller blocks taken up by settlers, a number of whom who went broke trying to farm their land. The current Culverden township was based around the site of the original homestead. Re Henry Young - yes,he did indeed know that dashing military officer Edwin Hare Dashwood (later the 7th Baronet Dashwood of West Wycombe) from East India Company days, which is why he let Dashwood talk him into such a dodgy deal. Dashwood hadn't fulfilled the conditions of his lease by stocking the land, and as you'll probably know from Mannering's account, there ensued a race to reach Nelson and on arrival young Mannering, a complete novice as far as farming goes, was dispatched forthwith to the Amuri to take down a flock of sheep and secure the property, which Young named "Culverden" for "Culverden House" in Tunbridge Wells, England, where he had once lived. "Culverden"was a hopeless arrangement for Henry, a member of the Plymouth Brethren who had set up home in Nelson and later moved to Motueka so he could assist his friend, Plymouth Brethren evangelist, James George Deck, establish the movement in the Nelson area. Henry didn't get to keep all that Amuri land either - others managed to snaffle chunks of it, the worst offender being serial runholder George Duppa, who ended up with a large block for his "St Leonard's Station". A fascinating story. Henry did end up with two different runs later in Southland, but never really prospered as a farmer. In fact, for a man who had held the very responsible position of "Judge" within the E.I.C. Civil Service, Henry Young appears to have had the unfortunate knack of not infrequently making the wrong choices. My great grandfather Henry Young (1803-1881) set sail from London with his family in the screw steamer "Sydney", arriving in Sydney on 16th November 1852. He was accompanied on the voyage by 16 year-old Theophilus Mannering. Henry met Edwin Dashwood in Sydney, who according to Mannering’s memoirs ( https://collection.canterburymuseum.com/objects/714966 ) “offered Young the pastoral lease of 250,000 acres in the Amuri – then in Nelson Province – which included the pick of the grazing country there. Young accepted the offer and they crossed to Nelson in the 90 ton Comet.” … which arrived in Nelson on 24th December 1852 , with Dashwood (then aged 27) as a passenger ( https://paperspast.natlib.govt.nz/newspapers/nelson-examiner-and-new-zealand-chronicle/1852/12/25/2 ). I presume Henry didn’t literally accept the whole 250,000 acres of Amuri land! Henry had been in India with the HEIC from 1821 to 1834. I note that Edwin Dashwood had also been in India, but must have been there in a later period than Henry’s time there. Was the common experience of India what connected Henry and Edwin Dashwood in Sydney? Can anyone add anything to this interesting snippet of history? I have been researching the life of Robert Matthews,an Australian, who married Adela Naper a widow who owned the large Loughcrew estate in Co Meath in November 1946. Following her death in 1952, the estate passed to a Naper cousin whose second son Charles Naper later inherited the estate. He married Emily Dashwood of West Wycombe and following the death of Charles,she is now the present owner of Loughcrew. In late 1945, while on leave from the Navy, I was a guest at Loughcrew for 10 days,and I met the Australian who was also a guest. Matthew's life story is stranger than fiction and his disappearance in April 1953 remains a mystery. a property established originally in 1843 and known as “Grove Farm”. At the time it was situated on the north bank of the Moutere River in what is now Central Road, Lower Moutere, and owned by a Nelson brewer, Charles Christie. 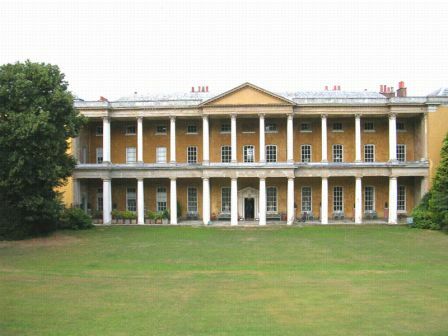 Dashwood renamed it ‘”Herstmonceux” after his home in Sussex, England, and set about substantially developing the land. He imported merino rams from Rambouillet, France, and started a merino sheep stud. He also brought back pheasants after a trip to England and liberated them in the area. However, his enterprise at “Herstmonceux” was dogged by bad luck and in 1857 he put it up for sale. His remaining time in New Zealand was spent in Nelson and on his sheep run at the Wairau. A short account of Dashwood’s time at Lower Moutere and his journey of exploration in search of an inland route to Canterbury, can be found in the “Motueka and District Historical Association Journal”, Vol. 3, pp. 29-30. The cover features an illustration of Dashwood’s home at the “Grove Farm” property, taken from a painting by Motueka pioneer, Sarah Greenwood.